I wanted to make a nice Mediterranean Dinner but didn't have all day so I cheated a little. 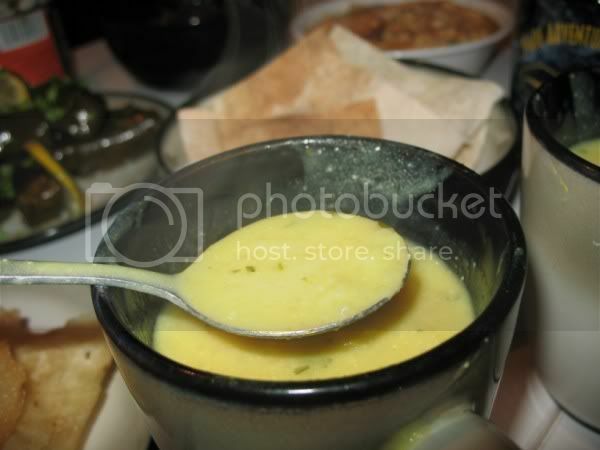 The Avgolemono Soup was from FreckleFoot over at PPK. It's delicious! Lemony and creamy and rich. The Hummus is from VCON. I added extra paprika and olive oil at the end. 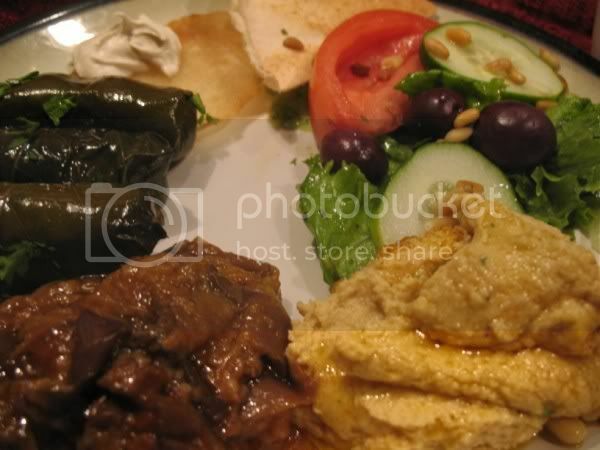 The dolmas and eggplant appetizer are canned and from the Middle Eastern market we have here. They were really good, especially for a canned appetizer. Very similar to one of my other recipes, this one has a layer of cheesecake flavor at the bottom. Let cream cheese come to room temperature and whip with powdered sugar. Spread mixture into the bottom of prepared chocolate crust. Meanwhile, melt chocolate chips in a double boiler or a glass/ceramic bowl on top of a pot of boiling water. OR if you are careful, I guess you can do it in the microwave. I use the double boiler. Mix remaining ingredients in a blender very well, scraping down sides. Add melted chocolate chips to blender very carefully, blending very well again. Spread mixture carefully over cream cheese. Refrigerate a few hours. You know it's done when it's firm in the center. Serve with fruit and/or chocolate syrup. Note- the pie will be pretty tall. You can reduce the chocolate, tofu, syrup, and vanilla by 1/4 if you wish. I let it be. The option for the cream cheese is just if you want more or less cream cheese at the bottom. The one in the picture is the lesser. The pie looks amazing! 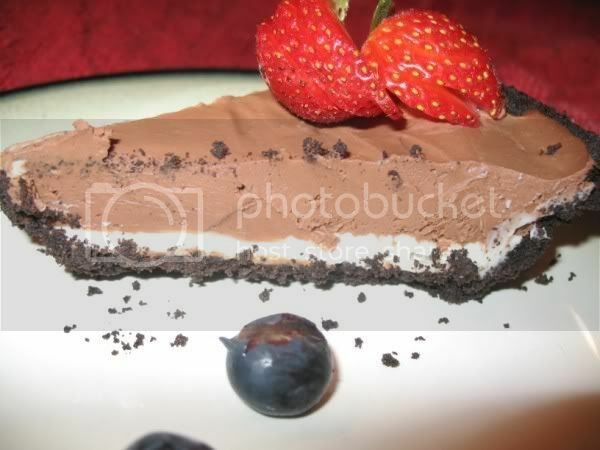 Combine cheesecake and chocolate pie is a great idea. Your meal looks great too, I had dolmas from a can once and they were actually pretty good.